Trader Joe's is an American chain of grocery stores based in Monrovia, California. By 2015, it was a competitor in "fresh format" grocery stores in the United States. As of October 12, 2017, Trader Joe's had 474 stores nationwide in 43 states and in Washington, D.C. The first Trader Joe's store was opened by founder Joe Coulombe in 1967 in Pasadena, California. Starting in 1979, it was owned by German entrepreneur Theo Albrecht, until his death in 2010, when ownership passed to his heirs. Trader Joe's is a subsidiary of German supermarket chain ALDI Nord. The company has offices in Monrovia, California, and Boston, Massachusetts. Trader Joe's is named after its founder, Joe Coulombe. The chain began in 1958 as a Greater Los Angeles area chain of Pronto Market convenience stores. The original Pronto Markets were so similar to 7-Eleven that Coulombe felt the competition with 7-Eleven would be disastrous. Coulombe is said to have developed the idea of the Trader Joe's South Seas motif while on vacation in the Caribbean. The Tiki culture fad of the 1950s and 1960s was fresh in the cultural memory, and Trader Vic's was at its height with 25 locations worldwide. He had noticed that Americans were traveling more and returning home with tastes for food and wine they had trouble satisfying in supermarkets of the time. The first store branded as "Trader Joe's" opened in 1967. This store, on Arroyo Parkway in Pasadena, California, remains in operation to this day. In the first few decades since opening, some of the stores offered fresh meats provided by butchers who leased space in the stores. Trader Joe's at one time had sandwich shops, freshly cut cheese and freshly squeezed orange juice all in-store. Germany's Theo Albrecht (owner and CEO of Aldi Nord) bought the company in 1979 as a personal investment for his family. Coulombe was succeeded as CEO by John Shields in 1987. Under his leadership the company expanded beyond California, moving into Arizona in 1993 and into the Pacific Northwest two years later. In 1996, the company opened its first stores on the East Coast in Brookline and Cambridge, both just outside Boston. Shields retired from his position in 2001. Dan Bane succeeded him as CEO after working as President of the Western Division. When Bane became CEO in 2001, there were 156 stores in 15 states. BusinessWeek reported that Trader Joe's quintupled the number of its stores between 1990 and 2001, and multiplied its profits by ten. Supermarket News estimated Trader Joe's sales for 2015 at $13 billion, and placed Trader Joe's 21st on the list of "SN's Top 75 Retailers for 2016." In February 2008, BusinessWeek reported that the company had the highest sales per square foot of any grocer in the United States. Two-and-a-half years later and in 2016, Fortune magazine estimated sales to be $1,750 in merchandise per square foot—more than double the sales generated by Whole Foods. In February 2016, due to customer feedback, Trader Joe's announced their goal "to have all the eggs they sell in western states (CA, OR, WA, AZ, NM and CO) come from cage-free suppliers by 2020 and all the eggs we sell nationally to come from cage-free suppliers by 2025." 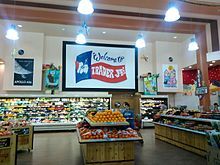 The May 2009 issue of Consumer Reports ranked Trader Joe's the second-best supermarket chain in the United States (after Wegmans). In June 2009, MSN Money released its third annual Customer Service Hall of Fame survey results. Trader Joe's ranked second in customer service. 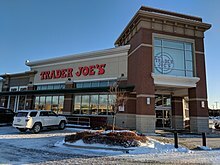 Although Ethisphere magazine listed Trader Joe's among its most ethical companies in the United States from 2008 to 2010, Trader Joe's did not make the list in 2011. In 2014, Consumer Reports again ranked Trader Joe's a top-scoring supermarket chain. Trader Joe's is known for its unusual store locations – this Trader Joe's store in Cobble Hill, Brooklyn, New York, is in a converted bank building. As of October 12, 2017[update], Trader Joe's had 474 stores in the United States with stores being added regularly. In 2017, Trader Joe's opened 14 new stores nationwide. Most locations averaged between 10,000 and 15,000 sq ft (1,400 m2). Each location is designed to represent its respective area. Every store has its own crew members that create artwork to represent the surrounding neighborhood. Some store locations have their own "find the mascot" and kids can obtain a prize when they tell a crew where it is "hiding". Trader Joe's is a tiki-nautical themed establishment but locational stores may include props to blend into the local area; for example, a surf theme for a store near the beach. Up until the early 2000s, Trader Joes advertised their toll-free hotline, 1-800-SHOP-TJS in their radio ads, to help customers find their nearest store. As of 2018, this number is no longer in service, and the ability to find the nearest store has been supplanted by more modern technology such as their web site. While a typical grocery store may carry 50,000 items, Trader Joe's stocks about 4,000 items, 80% of which bear one of its own brand names. Trader Joe's describes itself as "your neighborhood grocery store". Products include gourmet foods, organic foods, vegetarian foods, unusual frozen foods, imported foods, domestic and imported wine and beer (where local law permits), "alternative" food items, and staples such as bread, cereal, eggs, dairy, coffee, and produce. The company sells its bananas for 19 cents each instead of by the pound. Non-food items include personal hygiene products, household cleaners, vitamins, pet food, plants, and flowers. Many of the company's products are environmentally friendly. In October 2007, amid customer concerns, Trader Joe's began to phase out foods imported from China, and from February to April 2008, Trader Joe's phased out single-ingredient products from China because of customer concerns. Between 2012 and 2013, Trader Joe's moved from 15th on Greenpeace's CATO (Carting Away the Oceans) scale to third by removing six unsustainable species of fish from its shelves and getting involved in efforts to protect the Bering Sea Canyons. Trader Joe's discontinues individual products based on customer reactions more often than larger grocery chains to free up space for new items. Some products are exclusive to certain regions (e.g., midwest, east coast) of the United States depending on availability and popularity. Trader Joe's sells many items under its own private labels, at a significant discount to brand-name equivalents, and requires its brand-name suppliers not to publicize this business relationship. Trader Joe's labels are sometimes named in accordance with the ethnicity of the food in question, such as "Trader Jose's" (Mexican food), "Baker Josef's" (flour and bagels), "Trader Giotto's" (Italian food), "Trader Joe-San's" (Japanese food), "Trader Ming's" (Asian food), "JosephsBrau" (beer), and "Trader Jacques'" (French food and soaps). By selling almost all of its products under its own labels, Trader Joe's "skips the middle man" and buys directly from both local and international small-time vendors. Trader Joe's is the exclusive retailer of Charles Shaw wine, popularly known as "Two Buck Chuck" because of its original $1.99 price tag in California (local prices vary). Of the wine selection at Trader Joe's, Coloumbe has said, "We built Trader Joe's on wine first, then food. I tasted 100,000 wines, and most weren't wonderful. They were submitted to us by desperate vintners". Along with Charles Shaw, Trader Joe's is known for stocking a very large selection of California and New World wines. Trader Joe's has said its private-label products contain no artificial flavors, no artificial preservatives, no colors derived from anything other than naturally available products, no genetically modified ingredients, no partially hydrogenated oils (adding trans fat), and no MSG. In addition, its private label dairy products use milk from cows not given the artificial growth hormone rBST. Trader Joe's also has a "Fearless Flyer" that showcases new products or highlighted products of the month. The flyer is sent out periodically to homes upon request with no charge, and is available in-store. The company sends out "E-Flyers" that are only accessible online. Both flyers include stories about new products, a description, and even recipes. On May 1, 2018, Trader Joe's launched their first podcast, "Inside Trader Joe's". This podcast has five episodes and features crew members, store captains and executives. Listeners can learn about the way the retailer does business, where and how they discover new products, get answers to frequently asked questions, and more. “ The chain ranked low on Greenpeace’s sustainable seafood report card. The packaging is excessive, with even the produce sealed in plastic. The business model forces consumers to buy in quantities large enough to encourage waste. And most of Trader Joe’s products are made on equipment shared with everything you might be allergic to (dairy, nuts) or philosophically opposed to eating (dairy, meat). In September 2013, in response to the implementation of the Affordable Care Act (ACA), Trader Joe's explained that it would require part-time employees to work an average of 30 hours per week to qualify for medical insurance (with free coverage for basic dental and vision care still available for all Crew Members who work an average of 15 hours or more per week). Part-time employees not qualifying would now be eligible for plans available under the ACA (but available only to those whose employers do not offer them an insurance plan). Those working full-time were unaffected. In June 2017, Trader Joe's launched the “puff dog”, a roll of spiced sausage meat wrapped in puff pastry, which it claimed to have invented. Social media and British and Commonwealth media pointed out that the sausage roll was a traditional British savory snack, where bakery-chain Greggs sells around 2.5 million sausage rolls per week. ^ a b "Where in the dickens you can find a Trader Joe's?" (PDF). Trader Joe's. Archived (PDF) from the original on May 28, 2016. Retrieved June 6, 2016. ^ a b c d e f Kowitt, Beth (August 23, 2010). "Inside the secret world of Trader Joe's". Fortune. CNN.com. Archived from the original on August 16, 2014. Retrieved August 23, 2010. ^ "Trader Joe's CO Inc". Manta. Archived from the original on January 6, 2016. Retrieved March 26, 2015. ^ Lutz, Ashley (October 7, 2014). "How Trader Joe's Sells Twice As Much As Whole Foods". Business Insider. Archived from the original on June 30, 2015. Retrieved June 28, 2015. ^ "Whole Foods Is Slowly Killing Traditional Supermarkets". Archived from the original on September 20, 2016. Retrieved September 22, 2016. ^ "Our Story". Trader Joe's. 2017. Archived from the original on November 16, 2018. Retrieved November 16, 2018. ^ "Theo Albrecht: One of the two brothers behind the Aldi supermarket empire". The Independent. London. August 14, 2010. Archived from the original on April 7, 2014. Retrieved April 2, 2014. ^ a b c Armstrong, Larry (April 26, 2004). "Trader Joe's: The Trendy American Cousin". BusinessWeek and www.traderjoes.com. Archived from the original on September 5, 2015. Retrieved November 27, 2009. ^ "Theo Albrecht, Jr. & family". Forbes. Archived from the original on March 12, 2017. Retrieved March 10, 2017. ^ " Archived April 13, 2016, at the Wayback Machine." Trader Joe's. Retrieved on April 2, 2016. ^ Gardetta, Dave (September 2011). "Enchanted Aisles". Los Angeles. Archived from the original on October 17, 2011. ^ "For Trader Joe's, a New York Taste Test" Archived October 19, 2015, at the Wayback Machine, The New York Times, March 8, 2006. ^ "Trader Joe's targets 'educated' buyer". Seattle Post-Intelligencer. Associated Press. August 30, 2003. ^ "SN's Top 75 Retailers for 2016". Supermarket News. January 1, 2017. Retrieved January 22, 2017. ^ "Announcements | Trader Joe's". Traderjoes.com. February 12, 2016. Archived from the original on December 6, 2016. Retrieved January 22, 2017. ^ Kroll, Kathie (April 6, 2009). "Consumer Reports ranks top supermarkets". Cleveland.com. Archived from the original on February 17, 2010. Retrieved February 13, 2010. ^ "10 Companies that treat you right" Archived February 24, 2012, at the Wayback Machine, MSN Money, June 10, 2009. ^ "2008 World's Most Ethical Companies". Ethisphere. 2008. Archived from the original on January 11, 2010. Retrieved February 13, 2010. ^ "2009 World's Most Ethical Companies". Ethisphere Magazine. April 2009. Archived from the original on January 10, 2010. Retrieved February 13, 2010. ^ "2010 World's Most Ethical Companies". Ethisphere Magazine. April 2010. Archived from the original on April 19, 2010. Retrieved April 26, 2010. ^ "Wegmans, Trader Joe's, Publix, Costco & Sprouts Top Consumer Reports Supermarket Ratings". Consumer Reports. March 26, 2014. Archived from the original on April 7, 2014. Retrieved April 5, 2014. ^ "Trader Joe's Opens Fewer-Than-Average Stores in 2017". Progressive Grocer. Archived from the original on September 11, 2018. Retrieved September 11, 2018. ^ a b The American Way of Aldi Archived March 6, 2005, at the Wayback Machine, Deutsche Welle, January 16, 2004. ^ Hirsch, Jerry (February 12, 2008). "Trader Joe's halting some Chinese imports". Los Angeles Times. Archived from the original on October 22, 2009. Retrieved December 2, 2009. ^ "Carting Away the Oceans 7" (PDF). Archived from the original (PDF) on October 21, 2013. Retrieved November 2, 2013. ^ "Why does TJ's frequently discontinue products?". Trader Joe's. Archived from the original on January 22, 2010. Retrieved January 15, 2010. ^ Thayer, Warren (June 1, 2002). "Trader Joe's is not your 'average Joe!' With perhaps 85% of sales coming from private label, this secretive bi-coastal chain has a playful – and highly effective – formula". Private Label Buyer. Archived from the original on February 12, 2008. Retrieved February 22, 2008. ^ Franson, Paul. "The Origins of Trader Joe's and Why Americans Don't Drink More Wine". Novus Vinum. Archived from the original on December 29, 2008. Retrieved November 5, 2008. ^ "15 secrets Trader Joe's shoppers should know". Business Insider. Archived from the original on September 14, 2017. Retrieved September 14, 2017. ^ Joe's, Trader. "Trader Joe's Launches First-Ever Podcast Series". www.prnewswire.com. Archived from the original on May 17, 2018. Retrieved May 16, 2018. ^ Denver Nicks (September 17, 2013). "Trader Joe’s Explains why its cutting health benefits for part timers". The Washington Post (reprinted at swampland.time.com). Archived from the original on September 20, 2013. Retrieved October 8, 2013. ^ a b "Outrage as US ‘invents’ the sausage roll". June 24, 2017. Archived from the original on July 22, 2018. Retrieved July 22, 2018 – via www.bbc.co.uk.